Kootenay Lake Hospital welcomed its first baby of 2019 on Thursday, January 3, when Indie Rain was born to proud parents, mother Sage Laboucan and father Blue Netherelift of Slocan City and older brother Seth. Indie Rain arrived a healthy seven pounds, 10 ounces. However, the New Year’s Baby for the West Kootenay, and Heritage City, busted onto the scene almost 90 minutes earlier, at 4:01 a.m. when eight-pound, 12-ounce Gunnar was born at home across town from KLH to parents Steffen and Andrea Ulrich. Gunnar is the younger brother to 18 month-old-Ragnar. 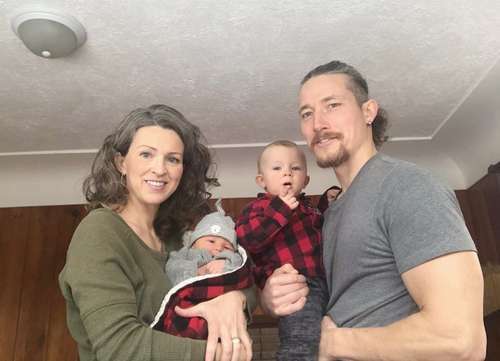 Steffen and Andrea Ulrich, who are eternally grateful for midwives Lisa and Lisa for assisting in Gunnar’s delivery, recently moved to Meadow Creek from Squamish to begin a sustainable life. Both families are resting at home with their new additions.